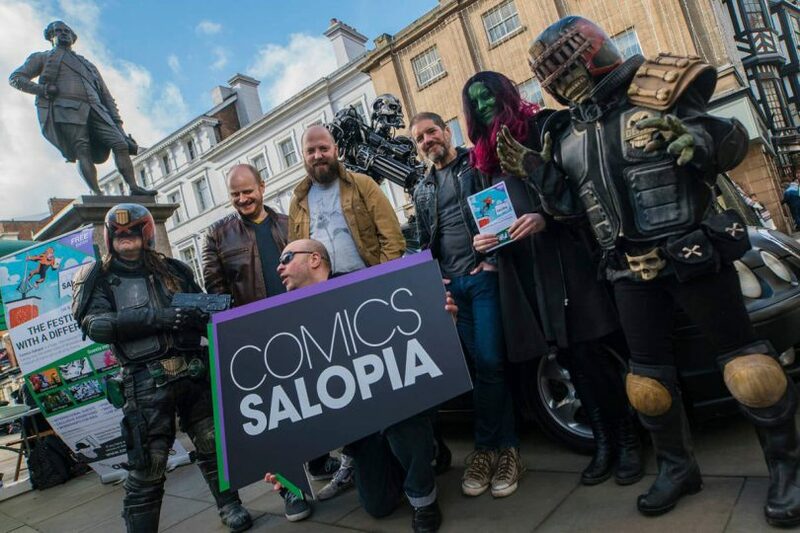 Organisers are thrilled to welcome the biggest names in the business from across the globe to Shrewsbury for Comics Salopia on Saturday 1 and Sunday June 2. People will be able to meet creators, artists, writers and publishers who have worked on titles for much-loved brands such as Marvel, DC, 2000AD and Star Wars. Andy Diggle, world-renowned editor and writer for the likes of Marvel, DC and 2000AD, who has worked on characters including the Green Arrow, Batman, James Bond, Captain America and Doctor Who. Chris Ryall, President, Publisher and Chief Creative Officer of IDW – one of the top four comic-book publishers in America, with game, entertainment and limited divisions. IDW publishes some of the most popular titles in the industry including Transformers, Star Trek, Teenage Mutant Ninja Turtles, Judge Dredd, multiple Disney projects, an all-ages Star Wars title, and literary-based projects with authors such as Stephen King, George R.R. Martin and Anne Rice. Headliner Frank Quitely, one of the most sought after comics artists in the business, who has worked on high profile titles such as New-X-Men and Batman & Robin. Chip Kidd, described by USA Today as “the closest thing to a rock star” in the graphic design industry, who is famous for his creation of the original Jurassic Park logo and also his beautiful design work on many of DC Comics’ coffee table books. Sarah Graley, of Rick and Morty fame and artist on the first official, soon-to-be-released Minecraft graphic novel. Elsa Charretier, from France, an artist with Star Wars and Marvel’s The Unstoppable Wasp to her name. Yanick Paquette, a Canadian artist who has contributed to titles including Wonder Woman, Avengers, Batman and Swamp Thing. They will be joining stars such as John Wagner, co-creator of the iconic Judge Dredd, and Marvel writers and artists like Kieron Gillen, Al Ewing, Tyler Kirkham and Christian Ward who between them have brought Thor, X-Men, Hulk and Venom to life, among other amazing characters. The festival also features Shrewsbury’s very own Charlie Adlard who has received numerous industry awards for his work on The Walking Dead, Hellboy comics artists Duncan Fegredo, Laurence Campbell and Ben Stenbeck, and Beano editor and artists John Anderson, Nigel Parkinson, Laura Howell, Lew Stringer and Hunt Emerson. Comics Salopia Chair, Councillor Jane Mackenzie, said: “Batman, Hellboy, Judge Dredd, Wolverine, Shrek, the Beano – all familiar and much-loved characters and stories, and you’ll be able to discover more at Comics Salopia from the very people who have been fundamental in their creation and development. “We’re over the moon that so many world-renowned comics stars are making the journey to Shropshire, to join the county’s own talented artists, creators and writers, for our festival. “However the event is not just for ardent comic book fans – the programme has been carefully designed for visitors of all ages, all walks of life and all levels of interest in comics. “Shrewsbury will be alive with the sights and sounds of the comics universe with activities everyone can enjoy at the Square, Castle, Dana Prison, University Centre, Museum and more. Many of the activities will be free to attend and money raised from the ticketed events will be going to the Share Shrewsbury charity set up by Councillor Mackenzie – helping people of all ages affected by addiction. Attractions include a free Kids’ Zone at the library run by Redan, publisher of best-selling comics like Peppa Pig, a range of workshops, a free entry Comics Fair, film screenings, face painting, Cosplay (Costume Play) and Jedi Fight Training.